Volcanoes, Earthquakes and Tsunamis - a review of S186. It always helps me to look back on what I have learned on completion of a Open University course, and I aim to take a look at a few key points from he last one - S186: Volcanoes, Earthquakes and Tsunamis. I'll make a start by looking at one misconception that I had held since my school days. If you think about the prospect of great expanses of rock flowing like a river, one inevitably thinks of rock heated sufficiently below the surface to change it into a molten state. Thus, when a combination of circumstances allow it to erupt from a suitable opening at the surface a river of molten rock, or lava results. One revelation produced by the course, was that the mantle was made up of solid rock, that circulates in a solid state - 'solid state convection' as it is known. Now just how can a solid lump of rock really circulate by convection? It defies logic surely? Generally speaking, a 'fluid' is anything that can 'flow', but in geologic terms it can include solids that when under specific conditions of pressure and temperature can also flow while maintaining their solid state. Arthur Holmes, in his renowned book 'Principles of Physical Geology' explains the paradox of flowing solids wonderfully. He gives the example of pitch, which behaves like a brittle solid if struck with a hammer causing it to shatter, but under ordinary temperatures, will flatten out into a thin sheet simply under its own weight. Another solid clearly seen to flow is ice. At first sight, what may seem to be a static expanse of ice, rapidly (in geological terms) flows down the mountainside. 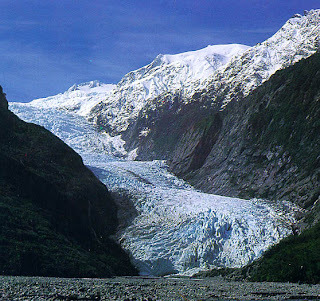 The photo above, of the Franz Josef glacier almost looks like a river, complete with rapids! As Arthur Holmes stresses, the key is time. Holmes illustrates this with the example of a ball bearing. If one is dropped into a jar of water it would take only a second to sink to the bottom. If the jar was filled with oil it would take several minutes. If filled with wax it would take maybe a hundred years to reach the bottom and if filled with ice and kept at a constant temperature, it would take millions of years. So it is with rock. If pressure is maintained for long enough, rock will flow and bend and in the mantle it circulates. However, when rock rises, the pressure upon it decreases, causing partial melting and a change to liquid form. This of course leads to the formation of igneous rocks by way of extrusion at the surface through a suitable fracture to form extrusive rocks such as basalt, or cooling slowly below the surface to form intrusive igneous rocks such as granite. I will get stuck into the subject of igneous rocks and volcanoes next time. Sometimes, life never ceases to amaze at its power to excite, shock or bewilder. This week saw the truly shocking and heartbreaking as well as the beautiful and heartwarming. Firstly, the weeks work started with the distressing news that a serious accident had occurred over the weekend, on the road construction site where I work. For reasons yet to be determined, a young, 24 year old lad had been caught between the bucket and tracks of a large digger, which crushed one of his his legs below the knee. Sadly, after repeated surgery, doctors were unable to save the leg and had to amputate. Now, I'm of the opinion that work is a means of earning money to fund the rest of your life's activities. Some have the added benefit of gaining some sort of pleasure from their daily work while many more have to endure a high degree of tedium and drudgary, day in, day out, just to 'earn a crust'. But whatever one has to go through in order to earn a living, the least one can expect at the end of the days graft is to arrive home with a full compliment of limbs. God knows how this poor guy is going to come to terms with his new life. Hopefully he will get the support he deserves from all around him, including his current employers. My thoughts have been with him for most of this week and also with the the unfortunate colleague whose actions unwittingly brought about this unfortunate incident. Heaven knows how he is feeling too and I'm sure he will need just as much support to get over the trauma. If our employers corporate aims and trendy slogans mean anything, they will both get it! On a lighter note, the previous weekend saw the latest performance of 'Enchanted', the singing group of 'young ladies' including my eldest step-daughter Anna-Ruth. These gals are getting quite a reputation in the East Midlands and if you check out the You Tube videos highlighted in the right-hand column of this blog site, you'll see why! On Saturday they appeared in a concert with the Loughborough Male Voice Choir in Kegworth. The girls were outstanding once again as were the 'lads' from the Male voice choir. In the opinion of my wife and daughter, the choir could benefit from some younger blood and guess whose arm was twisted? Yep, 'fraid so! Thursday evening saw me going along to their rehearsal which proved an interesting experience, not least because it was difficult to determine quite where my voice lies. 'Bass' or Baritone - that is the question! It was a fun evening I look forward to more next Thursday! Watch this space for developments! Actually, this may well spawn a new blog! Better keep 'Holey Schist' a Geology/Natural History blog I think. Next up will be a look back at 'Volcanoes, Earthquakes and Tsunamis', the OU course recently completed which threw up such interesting questions as 'when is a solid not a solid'! Answer to be revealed . .